Evernote is currently one of the leading cloud services. Its popularity has grown, not only for individual use, but for corporate use as well. However, protection against data loss is one of the most critical security points for individuals and small businesses and has created the need to backup Evernote. Evernote stores all of your data on their servers and it is highly unlikely that any of your data will ever be lost, at least not due to any error by Evernote. However, user error is the leading cause of data loss- and Evernote cannot help you in that case. But you can help yourself- you just need to backup Evernote. In 1990, noted organizational theorist and sociologist Charles B. Perrow noted in his book “Normal Accidents: Living with High–Risk Technologies” that operators and the personnel handling data are the blamed for disasters and data loss 60-80% of the time. Other studies have shown that of all the users that accidentally deleted or modified their data, 70% don’t even remember when. In most cases, by the time the data loss is discovered, the Evernote history and trash is completely gone. This would not happen if you backup Evernote data. Whether accidental or deliberate, human error can cause huge problems for individuals, small businesses and large enterprises- data loss can cause a loss of revenue, as well as the loss of important and critical information. The need to backup Evernote to another system is of utmost importance to prevent these costly occurrences. How to backup Evernote notes? Export all notes into one ENEX file. This can be accomplished by right-clicking “All Notebooks” and choosing “Export Notes.” Here is a detailed explanation of the full solution:https://support.evernote.com/ics/support/KBAnswer.asp?questionID=1283. 1. You will have to manually backup Evernote which can take a lot of time- just 15 minutes of backing up data spend every work day (mon-friday) amounts to 9 FULL DAYS of work per year. 2. Recovery is “all” or “nothing”: since everything is compressed into one big ENEX file, recovery of single note or searching for a note you want to restore can be a very complex and time-consuming task. 3. This is a good solution for disaster recovery, but for a disaster recovery situation to occur, Evernote will have to be the main cause of data loss on their servers, which is a very rare occurrence. Backup Evernote data directly- the data that must be backed up lives in the C:\Users\[Your Username]\AppData\Local\Evernote\Evernote\Databases directory, so you’ll want to make sure it’s included in your backups. Most “set it and forget it” backup applications will back up your home directory by default, but confirming that the Evernote data directory is included would be a prudent move. 1. Once again, you will have to manually backup Evernote. 2. Recovery is once again “all” or “nothing”: since everything is backed up, there is no way to restore or recover an individual note. 3. Recovery is complex and time-consuming procedure. 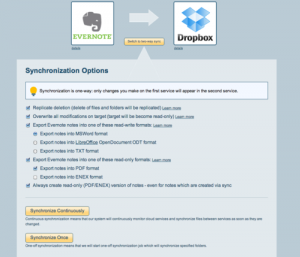 Use cloudHQ to sync and backup Evernote data. The best way to backup Evernote is to use the cloudHQ service, which is designed to replicate and synchronize data. 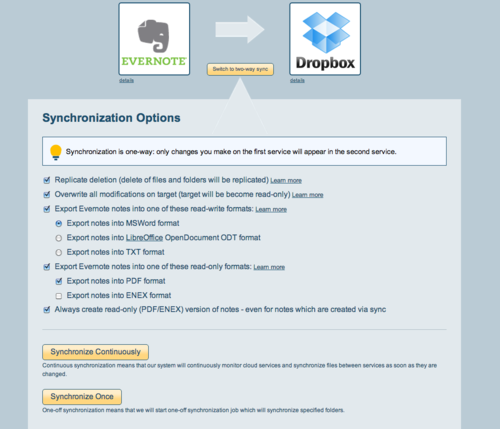 So cloudHQ can basically sync and replicate all your Evernote notes with Dropbox, GDrive,SkyDrive, or Box. Here’s how it works: cloudHQ will export your Evernote notes into TXT, ENEX, PDF,OpenOffice, and/or MS Word format. cloudHQ provides a continuous sync, which means any changes in Evernote data will be immediately sync’d to Dropbox (or GDrive, Box,SugarSync, etc.) Even if you revise or create Evernote data via mobile or via web interface, these changes will be backed up immediately. We also suggest that you setup a one-way sync to a Dropbox account in a different “security realm.” In other words, this account will not share the same password as your Evernote account, your PC is not authorized to access it without the password and it is not used for any purposes other than backup. This can backup Evernote securely as no matter what happens- your laptop gets stolen, your Evernote account is hacked and data deleted or even if user error results in the accidental deletion of data, all of your data will remain in the backup Dropbox account and can be easily restored without a big hassle. The cloudHQ setup is simple and when you securely backup Evernote, you can have peace of mind that your data is safe from accidental or malicious deletion. For more information, check out this article detailing why you should backup your cloud data to prevent loss.